Law schools are part of a production function for entry level lawyers. Therefore, if law schools alter their admissions practices, the character and complexion of the hiring pool can shift in significant ways. On the input side, the data are crystal clear: over the last fifteen years, the rankings arms race has pushed U.S. law schools toward a pure numbers approach to admissions. The more interesting question, however, is whether prestige-conscious law firms are now, inadvertently, experiencing any fallout. First the data. Law schools operate in an environment of supply and demand and are famously counter-cyclical. When Silicon Valley was booming in the late 90s, law school applicants plummeted. When the economy faltered in the early 90s or after 9/11, applicants spiked. Therefore, to examine how admissions practices have changed over time, it is important to pay attention to the underlying applicant pool. 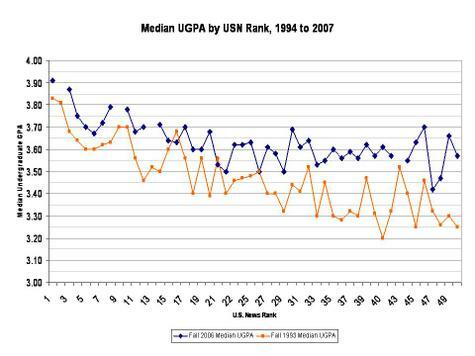 Below are trend lines for median LSAT scores by USNWR rank for 1994 and 2007, which reflect classes that entered in the fall of 1993 and 2006 respectively. During those two admissions cycles, the number of applicants was virtually identical: 89,600 (1994) and 88,700 (2007). Obviously the blue line (2007) is higher than the orange line (1994). 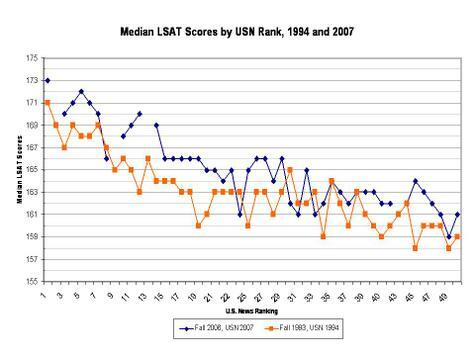 In fact, despite slightly fewer law school applicants, the average median LSAT increased by 2.18 points (std. dev. of 1.99). For the record, only three schools fell out of Tier 1 between 1994 and 2007. And it cannot be explained by the ABA policy shift that instructs law schools to no longer average LSATs for reporting 25th, 50th, and 75th percentile figures, thus slightly pumping up the volume of high LSAT scores. That change was not enacted until the summer of 2006. Although we might chock some of the higher UPGAs (avg. of +.17, std. dev. of +.12) on grade inflation between 1994 and 2007, it is likely that schools were also trying to maximize this number. More after the jump ... . When admissions officers are under constant pressure to beat last year's numbers, something has to give. I suspect it is students who took challenging majors but have LSAT scores slightly under the target. Or applicants with impressive work experience, evidence of leadership, or a history of overcoming major obstacles. Although LSAT and UGPA scores are strongly correlated within the applicant pool, they tend to be very weakly correlated (or sometimes negatively correlated) at individual law schools. Why? Because applicants who are above both medians tend to have admissions offers at higher ranked schools. After a school locks down its target LSAT and UGPA medians, the modest overlap between the two groups means there are precious few spots left. And often those spots are used to improve a school's diversity profile. Over the years I have talked with many admissions officers. They corroborate the sea change. Further, many of the old hands argue that the current fixation on maximizing numbers is misguided--that, based on their experience, great candidates are being passed over for nondescript or unadventurous students with high numbers. In other words, a large portion of candidates with compelling resumes and personal statements are being systematically pushed down to lower ranked law schools. At a law firm level, there is a certain irony at work. Many partners could not get admitted to their alma mater; yet, between 2005 and 2007, as NLJ 250 hiring increased rapidly, 53% of the new jobs went to students at USN Top 20 schools. Rigid adherence to the elite law school model drove the starting salary cost structure from $125,000 to $145,000 to $160,000--a legacy that is hard to swallow in a down market. But were these intangibles--now less prevalent at most law elite law schools--part of the firms' secret sauce? To my mind, this is an interesting question. Further, a recent Moneyball study by Kerma Partners suggests that the answer may be yes. The world was a different place in 1993. I was recently talking to a Law Firm partner who went to Columbia Law in the late 1980s and he couldn't believe that the plurality of my class came from California. He stated that most of his class came from the tri-state area. My point is that there may be a recent trend of law students going to the best school impossible, as opposed to the best school in their region. That would lead to people with higher GPAs and LSATs to concentrate at better schools. I wonder if the schools ranked 50-100 have recently had lower numbers as a result of this trend. I am a 3LE, and attended a third tier school for two years before transferring into a top tier school, which rejected me outright the first time around. It became clear to me that even the third tier school played the numbers game in admissions. Of the top 15 people (out of 70) in the evening division at the end of our 1L year, four of them had been wait listed. Of those four waitlisters, two (myself as one) have since transferred into top tier schools. My gut has long been that my personal statement and resume never got a look, and this story confirms that notion. For schools to only look at LSAT/UGPA is a travesty, because in the end, they are not the best predictors of quality of jurist (and by implication, jurisprudence). The composition of the bar in the future will reflect the stress placed on the numbers game, and not character and inclination. This, I fear, is all to our detriment. My personal experience would seem to support the hypothesis above. When I applied to law schools, it didn't seem like law schools placed any weight on undergrad major. I have a high GPA (3.8) in Electrical & Computer Engineering. The average GPA in most courses was just under a 3.0 at my undergrad school. Yet I generally did not do any better in law school admissions than one would predict using the aggregate GPA and LSAT information for the schools in question. That aggregate GPA data is derived from all incoming law students from the previous year, most of whom were in majors that gave higher grades. Of course, it is not always good to generalize based off personal experience as there are other factors that go into admissions. Current median scores are probably correlated to a fair degree with recent past median scores, so I wonder whether the difference between the baseline and 2007 is in fact explained by momentum carried over from the good times that were happening in 2004-2006, prompting lots more individuals to go to lawschool and drive up those numbers. What are the factors identified by Kerma Partners? This will all be moot in a few years. Illinois is following Michigan in its GPA only admissions policy, except UI will only require a paltry 3.0. This is a scandal. I hope UM and UI have to release the black/white ratio of students accepted under these programs. I suspect they won't.